Scary. Creepy. Spooky. And Fun. Halloween at Pigeon Forge is one of the best times of the year to visit. The entire month of October is filled with spooky thrills and frighteningly fun things to do for the whole family. In fact, why not stretch the Halloween weekend into a family mini-vacation? Just load up the car up and pay us a visit for some cozy fall fun in Pigeon Forge. There is so much to do, it’s scary. Every year, the Pigeon Forge Community Center hosts a safe, non-scary, family trick or treat event the Thursday before Halloween. Vendors from local Pigeon Forge businesses will be passing out candy to the kids. Many have fun displays and interactive elements to enjoy. There’s also loads of entertainment and a kid-friendly haunted house. It’s a totally free event, and a must-attend tradition carried out by the Pigeon Forge Community. 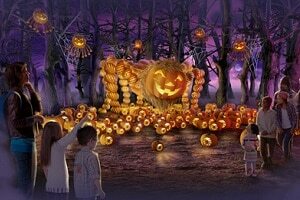 As part of Dollywood’s Harvest Festival, thousands of illuminated jack-o-lanterns will fill the Timber Canyon and Wilderness Pass areas of the park. Other exciting features of LumiNights include a glowing maze, pumpkin carving demonstrations, glow-in-the-dark face painting, meet and greets with Halloween characters such as Harvey the Pumpkin and Vine Vinny and so much more! Smoky Mountains are such a popular destination for young and old alike. The Pigeon Forge area offers an abundance of activities and attractions that are perfect for a fall family getaway or weekend trip for two. 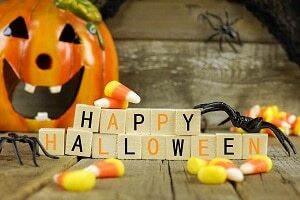 Explore more fun family events and things to do in Pigeon Forge this Halloween!